One common use when defining a new ItemContainerStyle for an ItemsControl is to do something special with either the currently selected item or the item that the mouse is currently over. 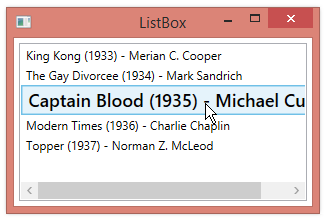 The default template used as an ItemContainerStyle for a ListBox, for example, changes the background and border for both the selected item and the item that the mouse is currently over. Below is an example where we change the FontWeight for the currently selected item (to SemiBold) and make the item larger, using a transform. This method uses a trigger to change several properties.